Anyways, I never had artichokes growing up. I’d never even tried one until I think after college when my roommate ordered it on pizza. I still don’t really get them and I certainly couldn’t make them edible if I was presented with one. 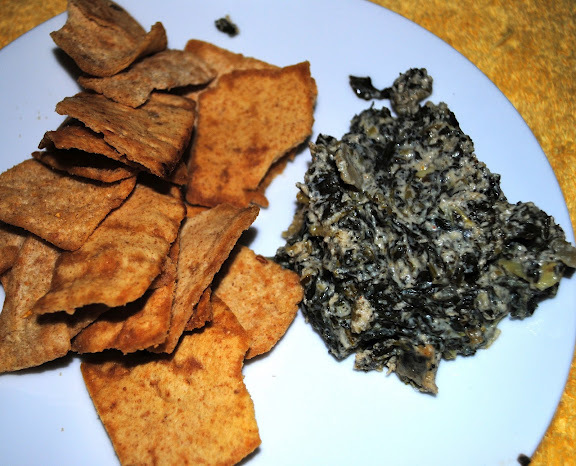 I can saute them out of a can and then bake them into a dip! Oh yeah! Mad cooking skills right here! Hollah! Anyways, consider this part 3 of my Super Bowl recipes- BBQ Chili and Funfetti Footballs being Parts 1 and 2. In your blender, combine the rest of your ingredients until smooth. 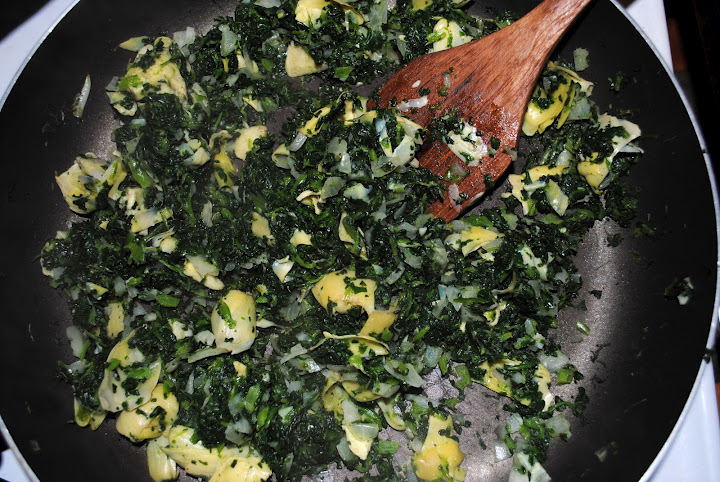 Pour the tofu sauce into the pan with your spinach and artichokes and mix until fully incorporated. Transfer to a baking pan and bake for 15-25 minutes or until the top is golden brown (the recipe says 15-20 but mine needed the extra 5 minutes. Also, I used a 9″ round cake pan). If your pan is not non-stick, give it a quick spray with cooking spray before pouring your mixture in. *I have no idea what “marinated artichoke hearts” are. Like I said, I’m an artichoke virgin. All I know is, nothing at Whole Foods had this on the label. So I opted for a can of organic artichoke hearts packed in water, not oil, and salt and pepper. They worked perfectly! This. Is. Delicious. 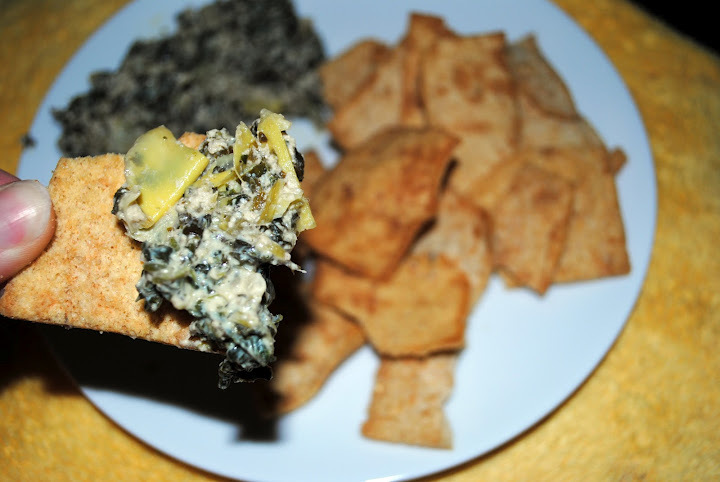 I know my pictures are atrocious because I opted for that awful yellow background (sorry about that) and because quite frankly, artichoke and spinach dip just isn’t pretty! But trust me. 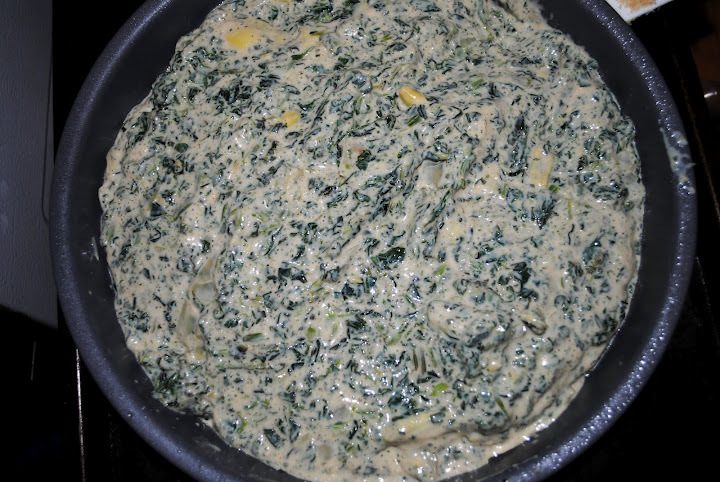 It’s also significantly healthier then a traditional spinach and artichoke dip which has tons and tons of cheese and mayo. It will help you and your friends keep those New Years Resolutions. Yeah, remember those? In fact, I can’t think of one reason you shouldn’t make this recipe! So there!